...Szolnok, midday, hot and sunny. I offload my case at the baggage office for 150 forints. As I lift it onto the counter the handle slips out of its bracket. On my return, I find the burly Hungarian behind the counter has fixed it up for me. The wheels are well on the way to being dead, although the case is only two weeks old. In fact, they have one day of life remaining. Along the long straight route into town, finding a magazine kiosk and buying a town map. The synagogue isn’t marked, but from my notes I can work out where it is, beside the River Tisza, down Szapáry utca to the intersection with Templom út. On the corner is a large schul with a huge domed tower, which turns out to be the building pictured on the front of the town map. 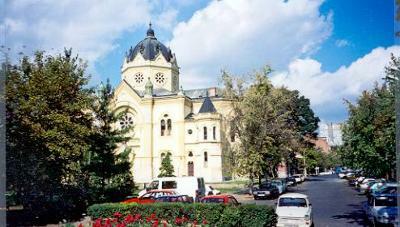 The synagogue is one of the landmark buildings of Szolnok, designed in 1898 by the synagogue architect Lipot Baumhorn. 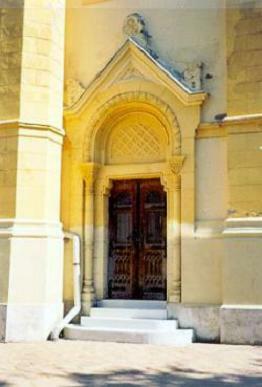 It has now been restored and is utilised as the town’s art gallery. Unfortunately, because of the repairs being carried out, the gallery is closed, the doors barricaded by black wrought-iron gates. Beyond the doors, bits of an exhibition about the River Tisza can be seen. My guidebook says that the interior has been painted white throughout, but that it is still possible to see many of the sumptuous architectural and decorative details. 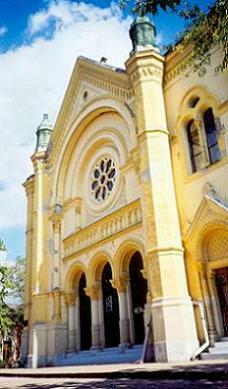 Jews settled in Szolnok in about 1830, and by the eve of WW2 there was a Jewish popluation of around 2500. According to my guidebook, the entire community was deported to death camps, of which some 600 people survived. 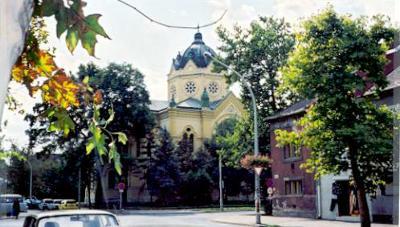 Nowadays only a few dozen at most remain in Szolnok, which has a total population of 78000.